Urticaria is an extensive skin reaction, with allergy characteristics, quite common, affecting about 20% of people at some point in life. Urticaria can occur in adults and children, and is usually triggered by infections, medications, food, heat, or other stimuli. Urticaria is not necessarily an allergic reaction, although it does have skin allergy characteristics. Urticaria occurs by an activation of cells of the immune system of the skin, called basophils and mast cells. These cells are responsible for the release of numerous chemical mediators, including histamine, a substance that causes vasodilation, itching, swelling of the skin and dreaded angioedema (mucosal edema such as mouth, eyes, and airways). Despite being closely related to an allergic process, the release of histamine by mast cells can be directly triggered by an infectious agent, such as a bacterium or virus. Urticaria can be a symptom of an infection, such as coughing, sneezing, sore throat, etc. In some cases, urticaria can occur secondary to physical stimuli, such as contact with heat, cold, sun, pressure on the skin, contact with water, exercise, etc. This type of urticaria is called physical urticaria, and it is also not a form of allergy. Allergic urticaria, on the other hand, occurs when a patient who is allergic to certain types of food, medicines or substances comes in contact with them. In these cases, urticaria is one of the manifestations of the allergic reaction. Urticaria is a common acne, about 20% of the population has at least one acute episode of the disease in their lifetime. About 50% of patients with urticaria have only skin lesions, 10% have only angioedema and 40% have skin lesions and angioedema together. Urticaria is called acute when it lasts less than 6 weeks and chronic when the process persists for more than 6 weeks. The possible causes of urticaria are numerous, but we are not always able to identify the triggering agent of the process. In acute urticarias, the cause is usually easier to identify. Patients with chronic urticaria often can not figure out why their skin mast cells act so aggressively. In children, more than 80% of cases of urticaria are not of allergic origin and occur due to an infection, be it viral, bacterial or parasitic. Among the possible causes are flu, colds, urinary tract infection, pharyngitis, mononucleosis, Coxsackievirus infection, HIV, mycoplasma infection or infestation by parasites such as strongyloids or ascaris. Urticaria can occur at any time during the course of the infection. Antibiotics, especially those in the penicillin family. Insect bites, especially bees and wasps. Contact with latex, such as wearing disposable gloves, blowing party balloons or using a condom. Foods such as eggs, milk, seafood, soy, dyes (even natural ones), nuts and peanuts. The skin lesions of urticaria are very itchy, reddish, embossed, varying in size and shapes, but tend to be circular. The lesions may be ring-shaped, with the center lighter and the edges raised and reddish. The itching can be so intense that it prevents the patient from sleeping. In some cases, the spots may be extensive and clump together, forming large plaques all over the body. When you press the lesion with your finger, it tends to lighten but quickly takes on the reddish color again. New lesions arise throughout the day, while the older ones disappear, creating a transient and migratory pattern. Each lesion usually disappears within 24 to 36 hours. Sometimes the same injury arises in the morning and is gone at night. The site of the most affected body may vary over the days. For example, on the first day, the abdomen may be the site with the most injuries, the day after the back and the third day the limbs. In more severe cases, the patient may have numerous injuries all over the body at one time. Acute urticaria lasts for a few days, usually 1 to 5, but there are cases that may take a little longer to go away. If the condition persists for more than 6 weeks, we classify urticaria as chronic. There are cases of chronic urticaria that last for years. 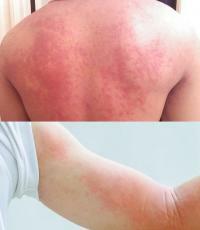 Acute urticaria can improve, give the impression of being cured and return suddenly. Most cases of urticaria are benign, but more severe allergic reactions can occur. The major danger is the development of angioedema and anaphylaxis. Angioedema is the swelling of the mucous membranes and deeper layers of the skin, usually presenting as swelling of the lips, eyes, tongue, hands, feet, or genitalia. Edema in the airways causes hoarseness and can obstruct the passage of air, causing breathing difficulties, constituting a medical emergency. Angioedema may take up to 72 hours to disappear. The main step in urticaria is to avoid exposure to the triggering agent of the reaction. However, this is not always possible, as in cases of hives caused by viral infections. In the vast majority of cases, urticaria is benign and disappears spontaneously in hours or days. The treatment, therefore, aims at relieving the symptoms, namely, itching. The main remedy for treating urticaria are the antihistamines, popularly known as antiallergics. These drugs inhibit the release of histamine, acting directly on the cause of skin lesions. Older antihistamines such as hydroxyzine and diphenhydramine cause drowsiness and can be helpful when the patient has difficulty sleeping. However, currently, 2nd generation antihistamines are the most commonly used because they cause fewer side effects and have a longer duration and can be taken only once a day. Among the new antihistamines we can highlight: loratadine (Claritin), desloratadine (Clarinex), fexofenadine (Allegra), cetirizine (Zyrtec) and levocetirizine (Zyxen). In severe cases, the required dose of second generation antihistamines to control symptoms may be two or three times greater than that recommended in the package insert. High doses of first-generation antihistamines should not be used as they cause many unwanted side effects. If the case is severe and the patient is not responding to high doses of antihistamines, the use of corticosteroids, such as prednisone or prednisolone, may be indicated for a few days. If the patient has signs of angioedema, he should be seen in a medical emergency and intravenous or intravenous medications may be needed. An injection of adrenaline can be used to reverse pictures of anaphylaxis and respiratory obstruction.